NEW: Search for books with Google Maps! Author: Mitcham, Judson Set In . . . In his highly anticipated second novel, Judson Mitcham, with plain but elegant language, creates an emotional impact rivaled only by his critically acclaimed debut novel, The Sweet Everlasting (Georgia). 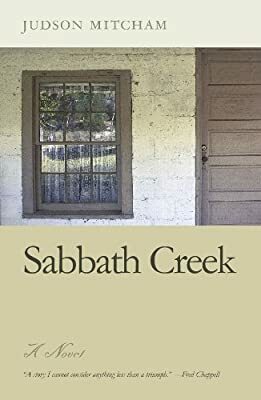 Sabbath Creek is the story of Lewis Pope, a fourteen-year-old boy thrust into an adult world of heartache and brokenness. When his beautiful but distant mother takes him on an aimless journey through south Georgia, the cerebral and sensitive Lewis is forced to confront latent fears—scars left from the emotional abuse of an alcoholic father and the lack of comfort from a preoccupied mother—that crowd his interior world. At the heart of the journey, and the novel itself, is Truman Stroud, the quick-witted, cantankerous owner of the crumbling Sabbath Creek Motor Court, where Lewis and his mother are stranded by car trouble. His budding friendship with the ninety-three-year-old black man is his only reprieve from the mysteries that haunt him. Despite his prickly personality and the considerable burden of his own personal tragedies, Stroud becomes the boy’s best hope for a father figure as he teaches Lewis the secrets of baseball and the secrets of life. Sabbath Creek is more than a coming-of-age novel. And while Mitcham provides a nuanced look at the relationship between a white adolescent boy and a black old-timer, his second novel transcends the tired theme of race relations in the South. This compassionate, smart, powerful work of fiction touches the pulse of the human spirit. It travels from the ruined landscape of south Georgia and takes us all the way through the ruined landscape of a broken heart.